(Nanowerk News) Nanoscale devices confine electrons and enable manipulation of electron spin—an inherent property akin to the direction in which the particle is rotating. An unexpected mechanism for this control in asymmetric structures has now been reported by Keiji Ono at the RIKEN Advanced Science Institute, Wako, in collaboration with a team of researchers from Japan and Taiwan ("Spin Bottleneck in Resonant Tunneling through Double Quantum Dots with Different Zeeman Splittings"). Artificial systems that trap electrons in a tiny volume can display many of the properties of atoms because they create an analogous series of discrete electron energy levels. "One example is the Zeeman Effect in which an applied magnetic field splits a single electron energy level into two, depending on its spin," explains Ono. Taking this analogy further, two closely spaced 'artificial atoms' can behave like an artificial molecule. In principle, it is possible to transfer an electron between these atoms by tuning the energy level of an electron in one atom to that of the second by, for example, applying an electric field. Indeed, this phenomenon, known as resonant tunneling, occurs in artificial molecules consisting of two identical atoms. Ono and his team showed, however, that the situation is not so simple in artificial molecules comprising two different atoms. 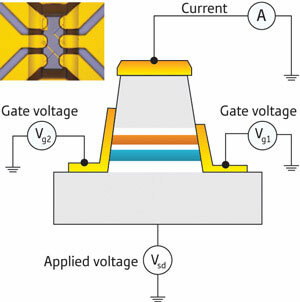 They investigated a structure that was a stack of alternating layers of semiconductor (Fig. 1). Electrons become trapped in the semiconductor with the smaller bandgap by the surrounding layers of wide-bandgap material. The top 'atom' was 7.5 nanometers thick and made of indium gallium arsenide. A 6.5-nanometer barrier separated this from the second atom: 10 nanometers of gallium arsenide. Etched pillars with a diameter of less than one micrometer confined the electrons in the transverse direction. The difference in size and composition meant that the Zeeman Effect was stronger in the top atom than the bottom one. This made it impossible to align both of the Zeeman-split levels in the two atoms at the same time. Ono and colleagues demonstrated that because of this, when an energy state from one atom is aligned with one in the second, the electron flow through the molecule reduces, an effect they call spin blockade. The flow increased when they tuned the two Zeeman levels in one atom to the midpoint of those in the other atom. "This finding can be used as a basic tool for selecting, filtering, or initializing an individual electron spin," comments Ono. "I hope this can be applied to quantum information technology."